1. The role of the Energy Manager is often assigned to the facilities engineering department, who has direct influence on these systems. 2. These are the easiest to understand, visualize, and justify for building and communicating the business case for these investments. I can see a lot of evidence that suggests that this approach is akin to conserving water on a golf course by eliminating flush toilets. Certainly, these efforts help but achieve only a fraction of the potential. 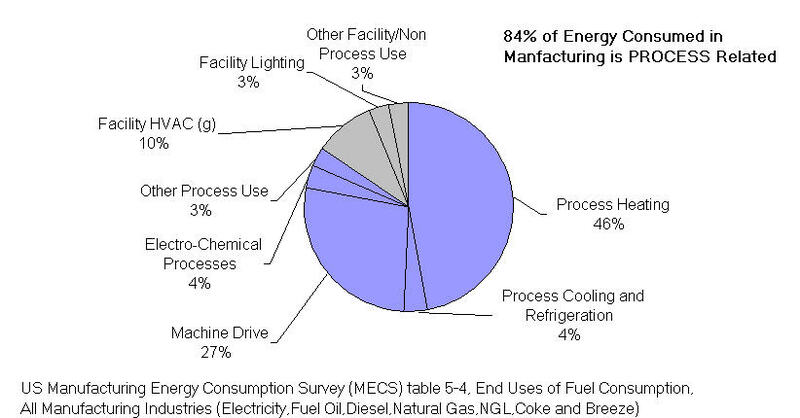 According to the US Manufacturing Energy Consumption Survey (MECS), 84% of all energy used in a process facility, on average, is used by the process itself (see pie chart below) The proportion is even greater in certain industries, such as mining, metals and mineral processing, and water treatment. What’s more, true process energy optimization often goes hand-in-hand with reduced maintenance costs, less downtime, and increased throughput-after all, machines that run less frequently and at lower temperatures tend to break down less often, which essentially yields higher ROI. The concept of process energy mitigation, however, is often perceived as too nebulous to be seriously considered as part of an energy management program—too difficult to talk about for all except for the true process experts. What I think is needed is a checklist of techniques which can be easily understood and articulated by all of the energy stakeholders including facilities engineers, process specialists, financial controllers, sustainability managers and executives, so that a business decision can be better supported using a common language. Giving these techniques consistent labels, such as the ones proposed, will only help promote the development of the technologies to support these functions and enable industrial plants to more easily focus their energy mitigation efforts on their process, where the majority of energy is used. I just want to say that I agree with this. Keeping things simple for the everyday employee and management is definitely a good thing. However with that being said, it is also important to merge these things with production and labor efficiency. With all three I truly believe that the gains can be enormous. I work in a production facility and they are always moving forward in energy demand, however if the employees and managers do not understand, than much is lost. Thanks for the article. 5 Steps to transition from “Facilities” Energy Management to “Industrial Process” Energy Management 3 Ways that Services Oriented Drives (SODs) and IIoT Improve the Efficiency of Industrial Operations Energy Efficiency: Better Lighting? Lower Bills? BAH! Process and Energy: A Match Made in Industrial Heaven?